This article was first published in the Ricardo Quarterly Review. It is used here with permission. The global pressure to improve fuel economy is driving radical innovation in engine technology. The next threshold in Europe, for instance, is a fleet average CO2 emission level of 130 g/ km, to be followed by an even tougher 95 g/km by 2020. The HyBoost project was initiated to meet and, if possible, to exceed these targets. The chosen technology path was more aggressive downsizing in combination with micro hybrid functionality. The project’s goal was to develop an extremely efficient gasoline powertrain delivering a CO2 emission level of under 100 g/km over the NEDC in a family size vehicle. This was to be achieved without noticeably impacting the vehicle’s driveability in comparison with the same model with a conventional, naturally aspirated gasoline engine. In order to maintain driveability, an electric supercharger, and additional energy capture and storage were added to the powertrain. 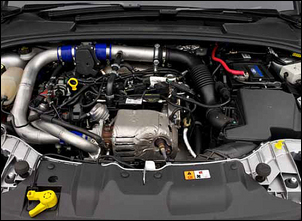 The notional baseline chosen as the benchmark for driveability and comparator for fuel economy was a 2009 Ford Focus with a naturally aspirated 2.0 litre four-cylinder port injected petrol engine. This engine produces 145 hp at 6000 rev/min and 185 Nm of torque at 4000 rev/ min, with CO2 emissions of 169 g/km with the standard five-speed manual transmission. 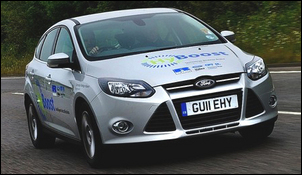 Vehicle, engine, and systems experts from many organizations collaborated within the HyBoost project, which was sponsored by the UK Technology Strategy Board. Led by Ricardo UK, the project’s partners included Ford, Controlled Power Technologies, Valeo, the European Advanced Lead Acid Battery Consortium (EALAB), and Imperial College London. The HyBoost project car was based on a standard 2011 Ford Focus, fitted with a downsized Ford Fox three-cylinder 1.0 litre turbo GDI EcoBoost engine equipped with a fixed geometry turbocharger. 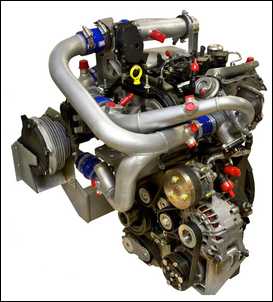 This engine was modified during the HyBoost research program to achieve the ambitious CO2 emission target. · Revised air intake, also giving better engine volumetric efficiency. The considerably higher gear and final drive ratios contribute a 4 percent improvement in drive cycle CO2 emissions, says King. However, despite the engine’s superior steady-state performance, poor transient response would normally mean such a small engine would not be considered with such high gear ratios. The solution devised by King and his team uses two key elements: electrical torque assist through the micro-hybrid system, and an on-demand electric supercharger. These run on energy harvested under previous vehicle coasting and braking events. The front end of the engine was adapted to accommodate a belt starter-generator (BSG), which provides a stop-start function and makes the HyBoost car a micro hybrid, capable of both adding to and absorbing power from the engine. The electric energy captured by this generator during deceleration events is stored in a 200 farad super-capacitor unit using double-layer capacitor technology. The electric supercharger provides up to 0.6 bar of boost pressure to eliminate turbocharger lag at low exhaust gas flow levels. Another change was to fit a Valeo water charge air cooler to bring down the intake temperature and thus control knock, one of the main downsides of high levels of boosting in gasoline engines. The engine achieves excellent brake specific fuel consumption, says King, under all operating conditions, without the need to inject extra fuel to control exhaust temperature. The Valeo BSG can deliver 4 kW in motoring and 6 kW in regeneration mode, offering the capability for neutral or “smart” charging to recapture electric energy during coasting or braking. Smart charging improved the vehicle CO2 emission level in the drive cycle by 4 percent, say the team, and a further 4 percent through torque assist from the BSG over the legislative European Drive Cycle during vehicle acceleration. In the HyBoost concept the recaptured energy is fully stored in the ultracapacitors. This system works with a floating voltage of between 18 and 27 V and can even go down as low as 12 V if necessary. Some of the stored energy is fed back into the conventional 12 V system via the DC/DC converter to ensure that the standard vehicle system works as normal. The HyBoost team explored an additional avenue of energy recovery during the program with the fitting of an exhaust-driven turbo generator downstream of the turbocharger. This was examined on the test bed only, where it gave promising results, delivering its target 1 kW average output. The current is fed back into the electrical system and powers either the electric supercharger or the belt starter generator, itself capable of adding up to 4 kW of torque boost. The stop/start function was also optimized by changing to an in-gear strategy. In contrast to most current stop/start functions the HyBoost engine is not started until the driver selects a gear and then actually lifts his or her foot off the clutch. The same applies when the car comes to a standstill: with in-gear control the engine will be switched off as soon as the speed reaches zero – even if the gear is still selected. In most stop/start systems the engine restarts as soon as the driver selects a gear. This happens approximately 2 seconds before the vehicle really needs to pull away and thus leads to unnecessary engine idling. As the BSG can start the engine quickly and can also provide up to 4 kW torque assist during pullaway, in-gear stop start adds a further 1 percent extra fuel efficiency benefit to the typical 4 percent benefit of neutral stop/start. With the electric supercharger reaching its maximum speed in under 0.2 seconds, this graph shows the potential fill-in it can provide between 1000 and 2000 rev/min engine speed and its effect on the torque curve. By combining turbocharging and the electric supercharger, the turbocharger acts as a pressure ratio multiplier of the supplied boost so the inlet manifold pressure achievable is significantly higher than either the turbocharger or electric supercharger could provide alone. This torque augmentation was not actually applied in the HyBoost car due to gearbox and driveline limitations, but shows the potential of using the electric supercharger for very high low-speed torque. Typically the supercharger is used in short bursts of one to three seconds duration. Owing to the higher engine power caused by the additional compressor airflow, the turbocharger rapidly receives a higher exhaust gas airflow, which improves its own transient response – meaning that supercharger boost is no longer needed. Even at an early point of development, load step response measurements showed that the time to turbocharger peak boost was halved when the electric supercharger ran for just two seconds. 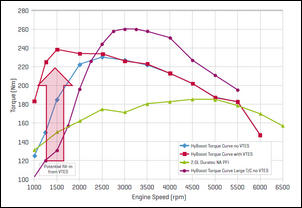 Engine dyno results showed that the target transient torque demand response time could be reduced from around 3 seconds to 0.7 sec at 1500 rev/min. Engineers use a variety of concepts to measure the specific performance of an engine. One of the most useful of these is BMEP, or brake mean effective pressure: it is a measure that is independent of cylinder capacity, so a small engine can easily stand comparison with a larger and more exotic one. The optimised HyBoost engine has been run at up to 35 bar BMEP and is currently operating at 29 bar in the prototype Focus. By comparison, says Jason King, a conventional non-turbo gasoline engine would be about 11.5 and a high-performance one up to 13; a boosted diesel could be around 19, and only very high performance turbocharged gasoline engines such as the McLaren V8, co-designed by Ricardo, can reach 25 or more. Generally, only very complex and costly two-stage boosted units reach 30 bar BMEP, observes King, so in this context the 35 bar of the single-turbo HyBoost is a doubly impressive achievement. As electric energy is in increasing demand in modern vehicles, the use of an additional electric device such as a 24 Volt supercharger requires a suitable energy management strategy. In the HyBoost engine this electric energy is recaptured by the starter-generator during braking. As the resulting energy flow from the generator is typically short but intense, a compact pack of ultra-capacitors is used for storage. 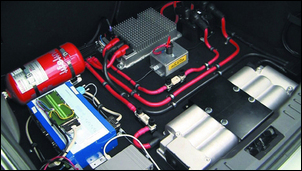 The ultra-capacitor unit can be placed anywhere in the car; its shape can be adapted within certain limits to make the best use of available space. At only around 9 kg this economic capacitor pack offers great cyclical robustness and can accept high charging currents. Since the stored energy is also needed in short bursts, ultracapacitors with their fast discharge rate offer the ideal short-duration energy supply required for the high-current operation of the stop/start system and supercharging. Yet though off-the-shelf ultracapacitor packs are already available, they are only used on a handful of vehicles, notably the Peugeot diesel hybrids. The HyBoost engine and project car demonstrate that petrol engine downsizing offers great potential for low CO2 whilst maintaining excellent driving characteristics if the problem of turbocharger lag is addressed through intelligent electrification. By using a practical mix of either proven or ready-for-implementation electric components, a 50 percent gasoline downsizing level can be achieved in this size of car with the same vehicle performance and driveability attributes that the corresponding non-turbo engine powertrain offers. In addition to this it adds less than 20 kg of weight versus the baseline 2.0 litre engine, which compares extremely favourably with the significant extra weight of a full hybrid car. Indeed, says Jason King, the project team has exceeded its 99 g/km CO2 target. At the end of the day the real beauty of the HyBoost approach is that it brings the benefit of electrification at a much lower cost than a full hybrid, says Adrian Greaney, head of the engines product group at Ricardo.